The NF-A12x25 is a highly optimised next-generation 120mm fan that integrates Noctua’s latest innovations in aerodynamic engineering in order to achieve an unprecedented level of quiet cooling performance. It takes state-of-the-art technologies such as the AAO (Advanced Acoustic Optimisation) frame or Flow Acceleration Channels and combines them with a record tight tip clearance of only 0.5mm, which is made possible by using the novel Sterrox® liquid-crystal polymer (LCP) compound as well as a metal-reinforced motor hub and axis for ultimate precision. Following the approach of Noctua’s A-series, the NF-A12x25 is a true all-rounder that yields superb results in all types of usage, regardless of whether it’s in low-impedance, airflow-oriented applications such as case cooling, or high-impedance, pressure-demanding scenarios such as on heatsinks and watercooling radiators. 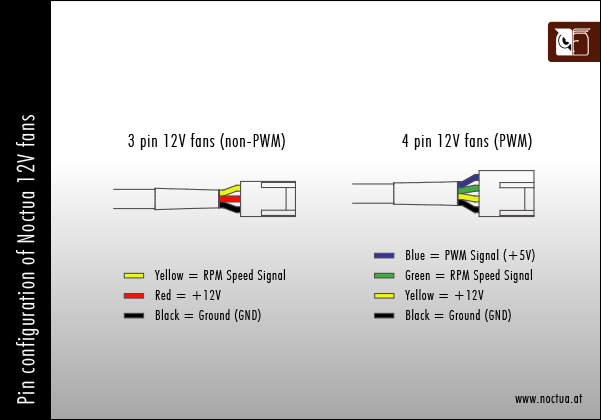 The 3-pin ULN version provides super-slow 1200/900rpm speed settings for ultra-low-noise applications and highly noise-sensitive users who demand near-silent acoustics. Topped off with exceptional running smoothness, Noctua’s reference-class SSO2 bearing, a rich bundle of accessories and 6-year manufacturer’s warranty, the NF-A12x25 is a premium-quality product through and through. Its superior efficiency, cutting-edge construction and pioneering materials make it an elite choice for the most discerning demands. Which 120mm fan is right for me? Noctua’s 120mm fans such as the NF-F12 and NF-S12A are renowned as being among the best on the market and have received more than 400 awards and recommendations from the international press. With its further improved efficiency and novel, state-of-the-art engineering, the NF-A12x25 represents another step up in performance and manufacturing. The NF-A12x25’s sophisticated aerodynamic design allows for a pressure to airflow (P/Q) curve that is extremely strong in the critical mid-section. This means that the NF-A12x25 is a true jack-of-all-trades with excellent performance in both static pressure demanding and airflow demanding applications. While many fans produce unpleasant, high-pitched noises when installed in typical applications such as on heatsinks or radiators, the NF-A12x25 has been carefully fine-tuned for optimal on-application acoustics. It produces a smooth, pleasant frequency profile and surprisingly low sound pressure levels (SPL) when working against back pressure. The NF-A12x25 impeller features suction side Flow Acceleration Channels. By speeding up the airflow at the crucial outer blade regions, this measure reduces suction side flow separation and thus leads to better efficiency and lower vortex noise. The NF-A12x25 has a record tight tip clearance (distance between the blade tips and the inside of the frame) of only 0.5mm. This highly ambitious design sets a new benchmark for 120mm fans and helps the NF-A12x25 to work more efficiently against back pressure, such as on heatsinks or radiators, by reducing leak flows through the gap between impeller and frame. The centrepiece of the NF-A12x25’s motor hub is made entirely from steel and the axle mount is reinforced with an additional brass structure. In combination, both measures ensure ultimate precision and increased stability in the critical hub area. The NF-A12x25’s impeller is made from Noctua’s novel Sterrox® liquid-crystal polymer (LCP) compound that features extreme tensile strength, an exceptionally low thermal expansion coefficient and damping characteristics that are ideal for reducing resonance and vibration phenomena in advanced fan-blade designs. 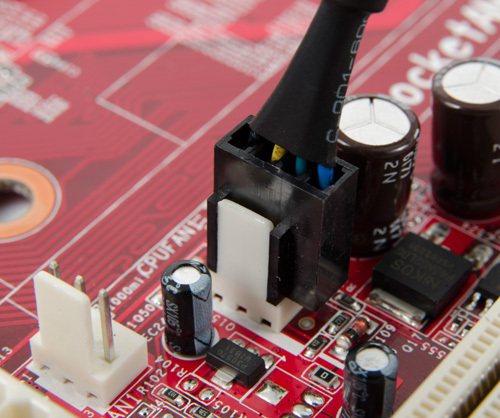 The NF-A12x25 includes a silicone gasket that can be used when installing the fan on watercooling radiators or other applications that benefit from a tighter seal with the fan. The gasket helps to damp minute vibrations and to reduce air loss between the fan and the radiator for optimal cooling performance. The NF-A12x25 features the further optimised second generation of Noctua's renowned, time-tested SSO bearing. With SSO2, the rear magnet is placed closer to the axis to provide even better stabilisation, precision and durability. In order to guarantee the highest possible degree of manufacturing precision, minimum tolerance and excellent long-term stability, the NF-A12x25 sports a CNC milled bearing shell made entirely from brass. Providing 1200 and 900 rpm speed settings via the supplied adapter, the ULN (Ultra-Low-Noise) version is tailor made for serious silent enthusiasts who demand super-slow running speeds and utmost quietness of operation. Thanks to its superior efficiency, the NF-A12x25 can outperform many 140mm fans. Combined with the optional NA-FMA1 adaptor frame that allows it to be installed on 140mm radiators, the NF-A12x25 is a great upgrade for 140mm-based watercoolers. Noctua fans are renowned for their impeccable quality and outstanding longevity. Like all Noctua fans, the NF-A12x25 features an MTTF of more than 150.000 hours rating and comes with a full 6-year manufacturer’s warranty. Well, Noctua took their sweet time with this and looks like it was all worth it in the end. [...] The NF-A12x25 is a fantastic fan for this purpose, and I am quite pleased to see a product that has had performance and noise as metrics for R&D over RGB lighting. Indeed, we see that the NF-A12x25 is among the very quietest of the fans tested so far (which includes some of the very best fans in the market) while performing in the better half of the segment. To provide more context, it is about as quiet as the Phanteks PH-F120MP (which I used to recommend to those prioritizing noise while still maintaining decent performance) while performing as well as the CORSAIR ML120 PRO RGB (which I used to recommend as an excellent performing fan). 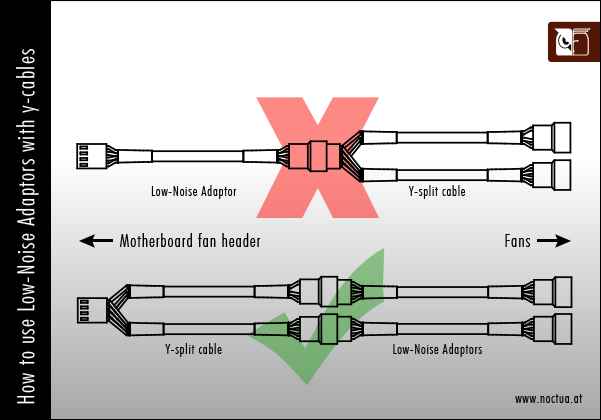 As it stands today, and pending the cost factor which we will get into in the next page, the Noctua NF-A12x25 is my overall top recommendation for watercooling fans from a performance/noise basis. Make no mistake, all fans tested today are already in that 'good to a very good range, the NF-A12x25 FLX and PWM however exceptional. You know the tale by now, anything that is exceptional isn't cheap. The NF-A12x25 series fans cost 30 bucks a piece. Some will be shocked, others can see and understand where that money went. That is what it is, but I'll just leave things at a simple compliment to Noctua, well done you guys, well done. All these fans come recommended as they are sweet in their class. And while it feels weird to hand out awards to some fans, the new NF-A12x25 fans, and especially the FLX and PWM, will get our very hard to earn best hardware award, these are just very impressive. And remember, Noctua gives you a 6-year warranty on both series as well. Four and a half years of investment into research and development, for any product, would almost certainly yield impressive results, but when all of that effort is focussed onto one fan, available in one colour and one size, the results are amazing. Our testing showed this fan blows everything else out of the water, including the Corsair ML-120, a fan known for its excellent performance. The construction of the fan is “no compromise” in every single way, going to unbelievable lengths to ensure optimal performance and minimal noise in the process. The fan is easily the heaviest we’ve encountered, tipping the scales at a mighty 201g. A Corsair ML Series 120mm fan, for example, weighs 148g. Noctua believe in their product so much, they tag it with a 6-year warranty; not shabby at all! To round up, if you’re after the best performance or silent operation, this is the only fan we can recommend, full stop. Yeah, it’s pricey at £26, but that is absolutely warranted in our opinion. Noctua zet met de NF-A12-serie een reeks hele bijzondere ventilators op de markt. Het heeft volgens de fabrikant dus ruim vier jaar geduurd om deze fans te ontwikkelen, maar het resultaat mag er dan ook wezen. In onze tests scoren de verschillende versies van de NF-A12 buitengewoon goed wat betreft luchtverplaatsing. De geluidsproductie is daarbij ook nog eens beperkt, wat in de praktijk nog lager kan uitvallen gezien de uiterst efficiënte werking van deze Noctua's. Het is een compliment dat Noctua de casefan, een onderdeel wat op het eerste gezicht zo simpel lijkt, dermate goed heeft uitgewerkt en doorontwikkeld dat de testresultaten van de concurrentie er in schril contrast mee staan. Praktický rozdíl sice už tak ohromující a znatelný proti jiným kvalitním ventilátorům už není, ale z hlediska poměru výkonu/hlučnosti a jistotě mnohaletého bezproblémového provozu, jsou absolutně nejlepší. Na ventilátorech je vidět všechna ta práce, ten zájem o co nejlepší výsledek a technologii, a to se musí ocenit. Žádné kompromisy v žádném ohledu. I have had these fans in my possession for a little while now and although I really wanted to just dive in, it was clear that to provide any results of use, a lot of thought would be needed in the testing and methodology to specifically provide results that were not only informative, but from which conclusions could clearly be drawn. Despite all the test results though, the conclusion is actually remarkably straightforward. Noctua makes great system fans. As above, the decision of which one/s you should get is ultimately directed by what your requirements are. The ULN models are a little more expensive than their standard models, but you get an excellently quiet performance and still remarkably good results. The better performing fans (in terms of speed) give excellent airflow but obviously run a little louder when put to the test. Que dire d’autre que l’évidence : oui, ce nouveau ventilateur de Noctua se révèle bien comme un bond en avant dans le domaine de la ventilation. Nous testerons plus de ventilateurs par la suite pour tenter de lui trouver un vrai concurrent technique, mais pour l’instant, c’est le vainqueur incontesté, et il justifie donc son prix élevé, surtout qu’il est garanti 6 ans. Η Noctua με τη σειρά ανεμιστήρων NF-A12x25 έθεσε μια νέα βάση σύγκρισης και τεχνολογικά όρια τα οποία θα χρειαστεί μεγάλη προσπάθεια για να ξεπεραστούν! Βέβαια το να αποτελούν τα προϊόντα της συγκεκριμένης εταιρίας μέτρο σύγκρισης δεν είναι κάτι νέο, αλλά εν προκειμένω, το θέμα πάει αρκετά πιο πέρα καθώς, ουσιαστικά ανοίγει νέους κατασκευαστικούς ορίζοντες με νέες δυνατότητες και -δεδομένου ότι αυτό είναι το πρώτο βήμα- πρωτοφανείς δυνατότητες βελτίωσης. Les nouveaux produits que propose la marque autrichienne profitent de tout son savoir-faire, aussi bien qualitatif que technique. Des technologies maison déjà éprouvées, au tout nouveau polymère mis au point pour l'occasion, rien n'est laissé au hasard pour faire de ces ventilateurs des "Must have" si l'on recherche l'efficacité. Le ratio performances / nuisances sonores est tout simplement excellent comme nous avons pu le voir. En ce qui concerne la fabrication, les modèles ne souffrent d'aucun défaut. Ils profitent d'une qualité d'assemblage haut de gamme comme nous le propose souvent Noctua. On remarquera juste que la couleur des pâles est plus claire qu'à l'habitude et surtout moins uniforme. Ce n'est pas une négligence, loin de là, mais juste un effet dû à la particularité du matériau utilisé. Vous êtes prévenus. En ce qui concerne le prix de vente, nous l'avons déjà annoncé en début de dossier. Comptez 30€ environ pour l'achat d'un NF-A12x25, quelle que soit la version que vous choisirez. Nous apprécions totalement le travail réalisé par Noctua pour la conception de son nouveau ventilateur, c'est pourquoi il est difficile pour nous de ne pas vous le conseiller. 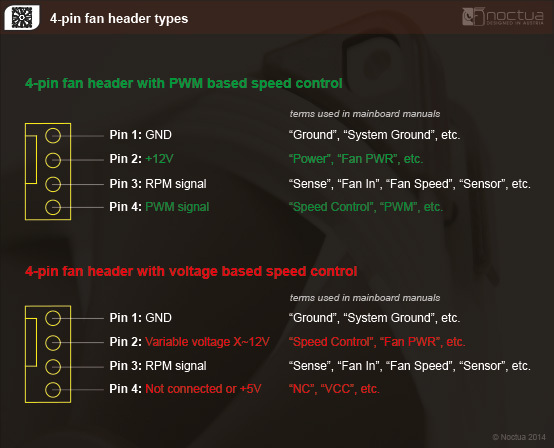 Les versions PWM et FLX conviendront sans problème sur radiateur ou ventirad, tandis que nous réserverons la version ULN à un usage "boîtier". Subjektiv empfinden wir die Akustik des Lüfters als sehr angenehm. Im Alltagsbetrieb mit automatischer Steuerung wird man von dem Lüfter ohnehin kaum einmal etwas zu hören bekommen. Dabei fällt die offizielle Minimaldrehzahl mit 450 U/min (+/-20 Prozent) noch nicht einmal besonders niedrig aus. Zumindest unser Exemplar konnten wir aber auch auf bis zu 330 U/min herunterregeln. Im Silentbetrieb sind uns auch keinerlei störender Lagergeräusche aufgefallen, und zwar weder bei horizontaler noch bei vertikaler Nutzung. Improves the performance of all-in-one (AIO) or custom (DIY) 140mm-based watercooling systems through the superior efficiency of the NF-A12x25 fan!